BEAUTIFUL TUSCANY AWAITS YOU ONLY MINUTES FROM THE STATE LINE. 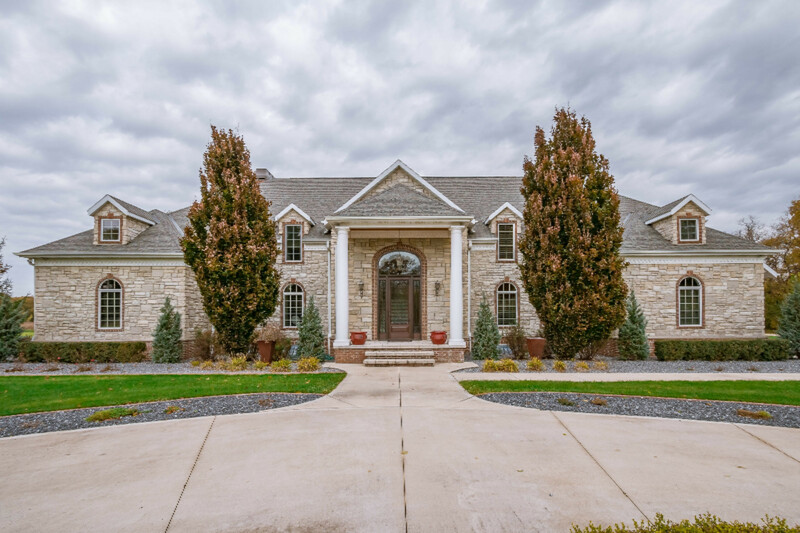 As you head down the long cement driveway to the outside fountain & brick entry, an artistic master piece awaits your entrance. The foyer is architecturally stunning with it's curved arches leading to the open area living, gourmet kitchen, and dining rooms with floor to wall windows and break taking views. A hand painted mural on the barrel ceiling leads into the magnificent master suite with pillar entrance into the extra large master bathroom with his and her walk in closets, a whirlpool tub and marble waterfall shower. With access from the master & living areas the patio area is built for entertaining with large outdoor kitchen, 3 ponds (one is a pool) waterfalls, a large pergola, TV and Surround Sound. The 4, 800 sq ft pole barn with 20' high ceilings is designed for your large motor home, and all of your toys. It is heated with epoxy floors, 2 offices, a balcony plus a connected 6 horse stall area. The 4,800 sq ft pole barn with 20' high ceilings is designed for your large motor home, and all of your toys. It is heated with epoxy floors, 2 offices, a full bathroom, a balcony plus a connected 6 horse stall area. Escape from your neighbors, and traffic into another world, yet only minutes from the action.